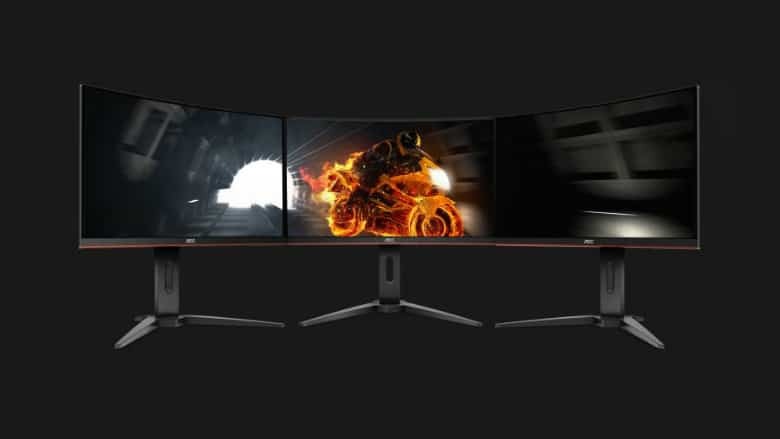 AOC G1 Curved Gaming Monitor Announced | Nerd Much? One of the worldwide leaders in computer monitors has announced a new line to make those gaming graphics pop. The AOC G1 Curved Gaming Monitor is promising to be an affordable line of gaming monitors with some power specs in tow. The AOC G1 Curved Gaming Monitor line consists of 4 models: a 32-inch QHD, a standard 32-inch, a 27-inch and a 24-inch. The G1 series begins pricing at the 24-inch model for $229.99. The entire line features full HD with 1800R within the monitor’s curved design. The 32-inch model supports QHD and the 24-inch 1500R. AOC states the screens provide fluid gameplay while utilizing144Hz refresh rate, AMD FreeSync and a 1ms MPRT response time. Multi-monitor setups aren’t just compatible – they’re encouraged. The AOC G1 Curved Gaming Monitor battlestations meld nearly seamlessly together thanks to the monitor’s curved design and thin bezels that extend around the top and sides. The 27-inch model of the AOC G1 Curved Gaming Monitor line is available now for $279.99. Later this year the other three sizes will go on sale. The 24-inch will be priced at $229.99, the 32-inch at $299.99, and the 32-inch QHD at $399.99. All of the monitors are backed by an industry-leading four-year advance replacement warranty. If you’ve been looking for a new set of screens to upgrade your gaming and general PC experience, you may have just found the ones.